When Dave and I were living in the city, we knew that we would probably end up moving to the suburbs, and we knew if we were going to do that, it would have to be before Kindergarten as we were sending Jake to private preschool and didn't want to pay for school past that. As most people know, there is just way too much going on with the public schools in the city, and we wanted the best education for our kids for the least amount of money. Living in the north shore, there are no politics regarding which school you end up in. You go to whichever district you live in, and thats it. All the public schools are great (typically) in the North Shore. I assume this has something to do with why our property taxes are pretty high (you pay for private schools, or public schools are paid through our taxes). We chose the North Shore (Deerfield in particular) as we both grew up there. Its almost as if everyone ends up where they grew up. The school districts I will focus on are Deerfield and the neighboring towns. This blog post is going to be more focused on Deerfield's schools, but I plan to focus on other schools in the neighboring area's in future blog posts. This will hopefully help guide you if you are not in the "know", just as I wasn't when I first moved here- as I didn't focus on those things when I didn't have children. But I do believe that its an important thing to consider when buying a new home. Deerfield's public schools are part of District 109. This is also the first year that Deerfield/District 109 is offering Full day Kindergarten at no cost to the families, other than books/supplies and materials, or any specific add on's. Helping Hands Preschool: Although this isn't "free" per say, I think its a great program, especially for children with special needs. The class sizes are limited to approximately 14 kids per class. They have a multi disciplinary team of highly qualified individuals to help support each child's growth and development. The program is offered at South Park Elementary. Helping Hands goes along District 109's schedules and they do offer flexible payment plans. The preschool is for 3 and 4 year olds, and they offer half day programs, Mon-Fri 9-11:30am for the 3 year olds, and Mon-Fri 12:30-3:00pm for the 4 year olds. Their full day options are Mon-Fri 9:00-3:00pm. Kipling Elementary School: Kipling contains grades K-5. School hours are Mon, Tues, Thur & Fri, 8:40am-3:25pm, and Wed 8:40am-2:25pm. All the district 109 schools release early on Wednesday's for staff to meet. Kipling adopted the "Leader In Me" program. This process was based off of Steven Covey's "7 Habits of Highly Effective People". Their focus is to teach the students the life skills they would need to be successful in anything. Walden Elementary School: Walden contains grades K-5. School hours are Mon, Tues, Thur & Fri, 8:40am-3:25pm, and Wed 8:40am-2:25pm. All the district 109 schools release early on Wednesday's for staff to meet. Walden's Mission Statement is "Provide innovative educational experiences of the highest quality that engage, inspire and empower each student to excel and contribute to improving the world." South Park Elementary School: South Park contains grades K-5. School hours are Mon, Tues, Thur & Fri, 8:40am-3:25pm, and Wed 8:40am-2:25pm. All the district 109 schools release early on Wednesday's for staff to meet. South Park School's mission is " To educate the whole child and ensure student growth." Their vision is "to develop a collaborative learning community and a positive school climate in which students and staff will feel safe to grow academically, socially, and emotionally, and where innovation is encouraged and proliferated." Wilmot Elementary School: Wilmot contains grades K-5. School hours are Mon, Tues, Thur & Fri, 8:40am-3:25pm, and Wed 8:40am-2:25pm. All the district 109 schools release early on Wednesday's for staff to meet. Caruso Middle School: Caruso contains grades 6-8, school hours are Mon-Fri from 8:00am to 3:00pm. Caruso is home to the Bluejays. The "Bluejay Way is being respectful, having fun, and continuously pursuing growth. Caruso is a 2017 National Blue Ribbon school of excellence. Shepard Middle School: Shepard contains grades 6-8, school hours are Mon-Fri from 8:00am to 3:00pm. Shepard is home to the Spartans. 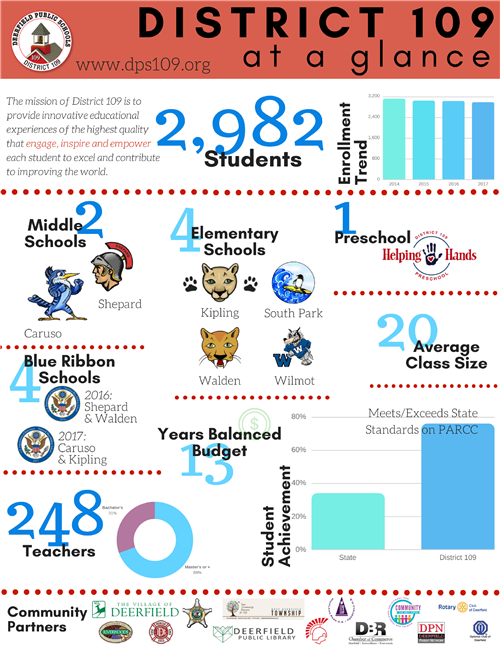 Shepard is a 2016 National Blue Ribbon School. Rest assured, no matter which school your kids end up in, in District 109. your children will still be getting a great education.